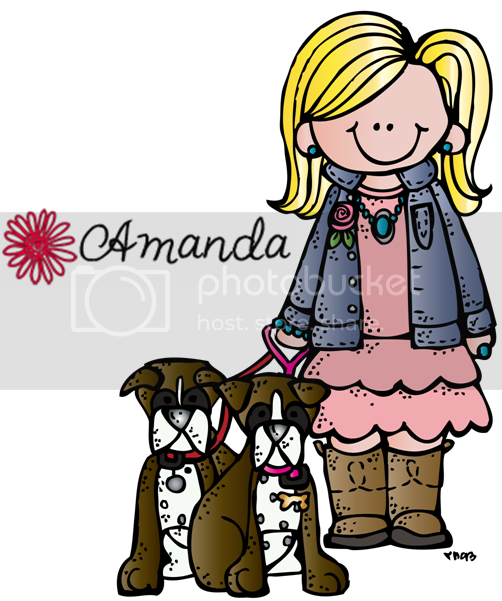 I'm looking for a class to partner up with for my Pet Pal Project for the 2013 school year. I blogged about this last summer (see below). I'm looking for another 2nd grade class who lives in a different part of the country (midwest or west preferably since we're on the east coast). If you're interested leave a comment or send me an email! What is a Pet Pal Project? It is a mix between pen pals and a class mascot. Two classes will pair up for the year. Each class needs a class mascot (stuffed animal). The classes will trade class mascots for a couple of months, allowing students from the other class to take the mascot home and document his travels. When everyone in the partner class has taken the visiting mascot home and "helped" it write about its adventures, it is sent back home so that each student in its class can take him home for a night and READ about its adventures! I love this project because it is a mix between reading, writing, AND social studies! How do I select a class as a partner for a Pet Pal Project? What materials do I need for the project? 1. A Class Mascot - This can be any type of stuffed animal. I started out using just a teddy bear. Then I moved on to use Schmooney, our city's mascot (and state's reading mascot). But, this year I've decided to use a MONSTER to match our new class theme. In fact, sometimes in the past, I've let the children vote on the mascot (after a persuasive writing project...see below). This year, since I've selected the mascot, I think I'll let them vote on the name for the monster. The more ownership they have in the project, the more excited they become about it! 2. A Bag - The mascot will be going home with students nightly, so it will need something to travel in. I have used just plain canvas bags from a craft store previously. You can decorate these with markers, paint, or iron on a transfer (available in the set above). 3. 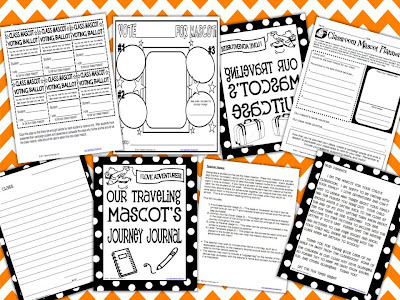 A Journal - Since students will be writing about the mascot's adventures, it will need to arrive with a journal. I've used composition books, spiral notebooks and binders in the past. This is really the teacher's preference. I find that the compositions books usually hold up the best for me. Those are the only items that you MUST have for this project, but if you really want to have some fun with it, keep reading! 5. Camera - I sometimes include a disposable camera in the bag, also. This is great because students can take their picture with the pet at their home or at other places throughout the city. The only downside to this is that sometimes the camera is lost, or one family will take lots of pictures (not leaving enough for other students). So, I have left this out in the past and opted to take pictures of the students with a digital camera at school. Either way, we print the pictures off and glue their pictures beside their journal writings. One year, I bypassed the pictures altogether and recorded my students saying goodbye messages to the pet. I made those into a DVD to send along with him. 6. Souvenirs - We also love to include fun souvenirs from our state!! We always find Kansas on a map and talk about it. One of the first things the students notice is that it is a landlocked state. Since they do not have an ocean nearby, we always decide to send them some things from the South Carolina coast. Each summer, I'm sure to bring back a large bag of sand, plenty of sharks teeth we've found, and shells that I've purchased or found. 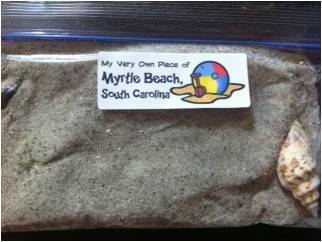 I create little bags so that each student in our partner class has a "little piece of Myrtle Beach, SC" and can dig through their sand to find a shark's tooth and a shell! I also include a postcard with the different types of sharks' teeth so students can use it to discover what kind of shark their tooth is from. 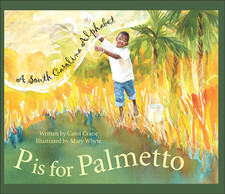 In addition to this, I include other SC postcards with facts about our state, salt water taffy from the coast, a South Carolina license plate, some palmetto (our state tree) items, and usually some peach rings. * I require my students to write in the form of a friendly letter in the journal....just another great opportunity to review this skill! * I usually take the pet home first so that I can model my expectations...I provide lots of details and maybe even an illustration. Amanda, I would love to partner up with your class! I will be teaching second grade in Oakland, California (just across the bridge from San Francisco). Please let me know. I would love to partner up for this! It sounds like fun! So FUN! I just moved to Hawaii...let me know if you still need someone! Hey do you have a partner yet? What grade are you teaching? I'm from Michigan and would love to give this a try! I thought of you tonight when I was at the Dollar Tree and they had tons of monster cutouts! Out in Colorado if anyone is interested in a 2nd grade class! Hi Colleen. I teach 2nd grade in the lovely state of Michigan and would love to discuss pairing up if you are interested! I would also love to partner with you! I passionately teach 2nd grade on the Oregon coast. I love your souvenirs because my school district's focus is Ocean Literacy. Every grade studies a different aspect of the ocean and 2nd grade's theme is "Sandy Beaches." I am amazed at how different the beaches are from the East Coast to the West Coast! My students would absolutely love the experience and opportunity to partner with you... it would literally be from coast to coast! I'm not a second grade teacher, but I would love to do this with my third grade class if anyone is interested. I'm in Texas. I think this sounds like so much fun! I teach third grade in Illinois - would love to team up!! I am a 2nd grade teacher and would love to do this with you or another class! Oops forgot! I'm in Michigan! I would love to go this with another 2nd grade class! I teach 2nd in Missouri (a suburb of Kansas City)! Let me know if anyone is interested! Thanks! If you still looking for somebody I would be interested. I teach second grade and live in the suburbs of Chicago. So we get all kinds of weather. Our school mascot is a tiger. We did the Pet Pal last year too but only did it in our class. What fun to exchange with another class. Since you are in SC too, we are too close but I would love to participate if anyone else is out there.T Our class had a stuffed Hermit Crab that went home in a clear plastic cage like container with a handle. It was SO much fun! Students took him, his name was Douglas, for 2-3 days and wrote in a journal about their adventure together. Some took pictures of his travels. Douglas even went to Disney World!! Yes! There is a picture of him outside the Cinderella castle! I teach third grade near Milwaukee, WI. I would love to have a pet pal partner class. East or West Coast would be preferred. My e-mail is eveningstar02@hotmail.com. Oops, I have a third grade class. Where are you? I am in 3rd grade in California. I have a 3rd grade class in Corcoran, Ca! Let me know if you are interested? I would love to have do the Pet Pal Project with someone. I have a second grade class in Illinois. I teach first grade in Texas and would love to join up with your class if you are still interested. I think that is such a wonderful idea! I may have to use this this year... still think my 4th graders would enjoy something like this too! I love this idea so much!!! I am a second grade teacher from Dodge City, KS. If anyone would like to partner up with me I would love to do it. Thanks! I'm in Indiana and would love to have my class be your Pet Pal if you haven't picked one already. I can be reached at brenwo92@gmail.com. I am looking for a pen pal class, not necessarily a pet pal class. I teach 2nd grade in upstate NY. My partner in crime next door would also love a pen pal class. Anyone interested? I also like the idea of having a class in a different part of the US to pair up with! Let me know! WHAT A NEAT IDEA!!!! I love this & must borrow this idea! Anyone want to partner up? Hi Risa! I would love to team up, but I teach 3rd in California. Do you know a 3rd grade teacher who would like to team up? I can ask my 2nd grade teachers if they are interested - let me know. :) Thanks! I am teaching 5th grade this year (my first year) and I love this idea. Would anyone be willing to be my class pet pal partner? I would love to have a Pet Pal for my 2nd graders. Would there be anyone willing to partner with me? I'm in Boise, Id. I'd love to hook-up with a class from back east or the south. Hi, I am interested in doing this project with you. I am a librarian in a K-1 building. I would select a 1st grade class to share it with. Most likely the highest end class. I am located in the heart of Kansas, the home of Dwight David Eisenhower. We have a library mascot named Amanda Panda and I would love to send her or her son Andy Panda (who is much smaller) your direction. Let me know if you are interested. My blog is www.primarylibrarydiva.blogspot.com.